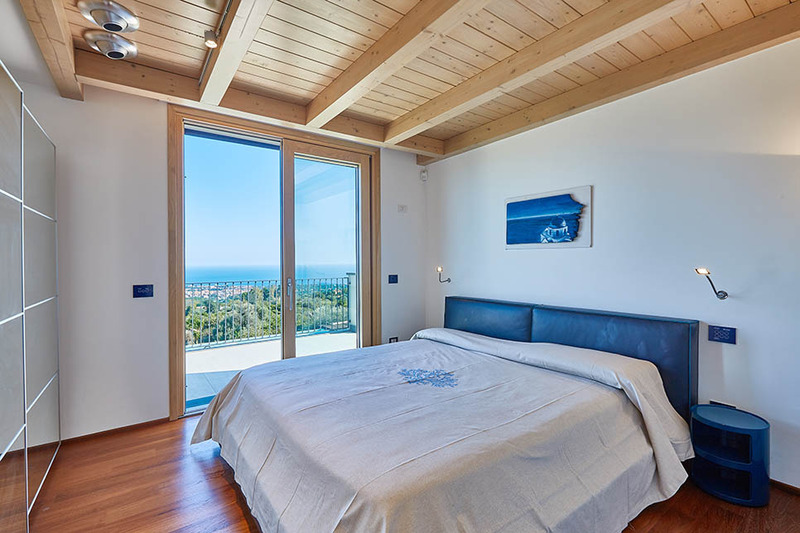 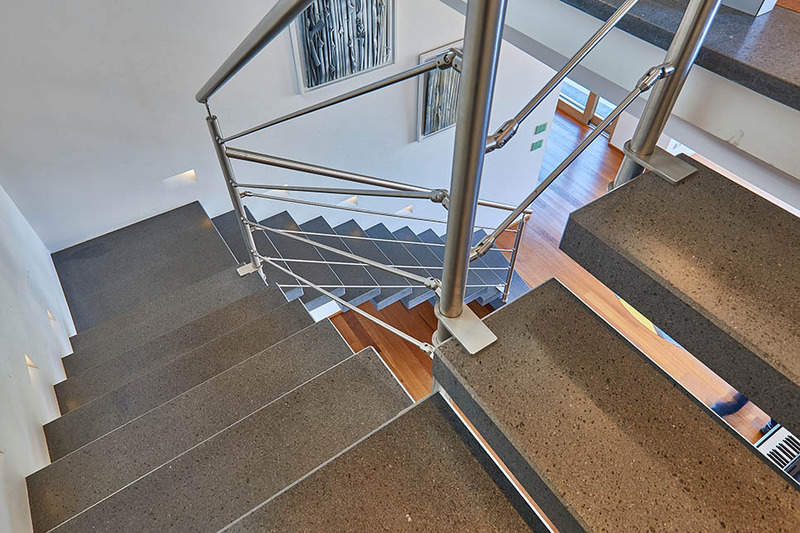 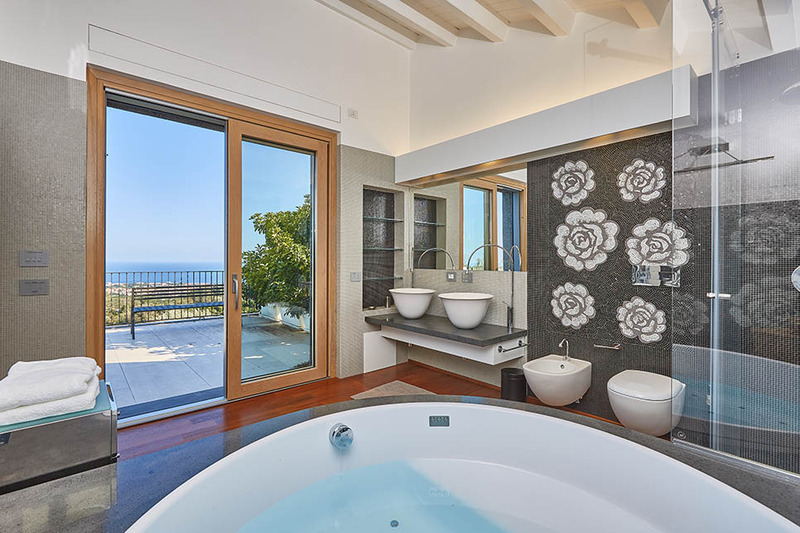 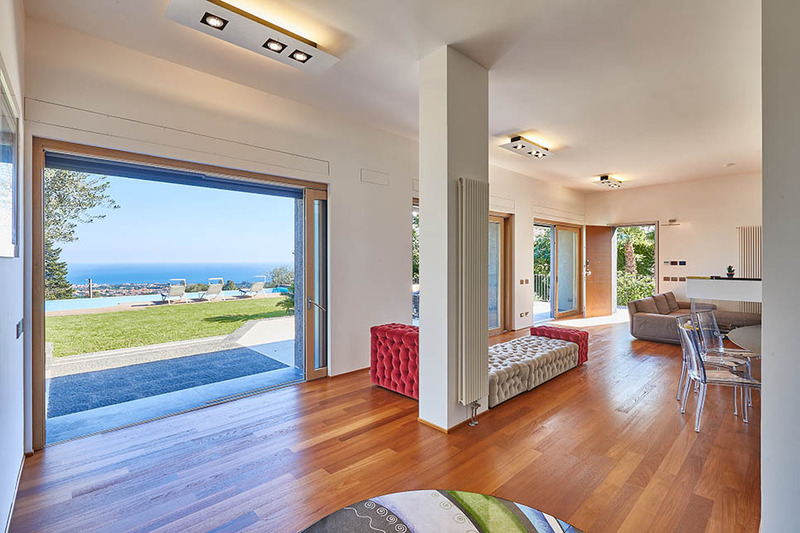 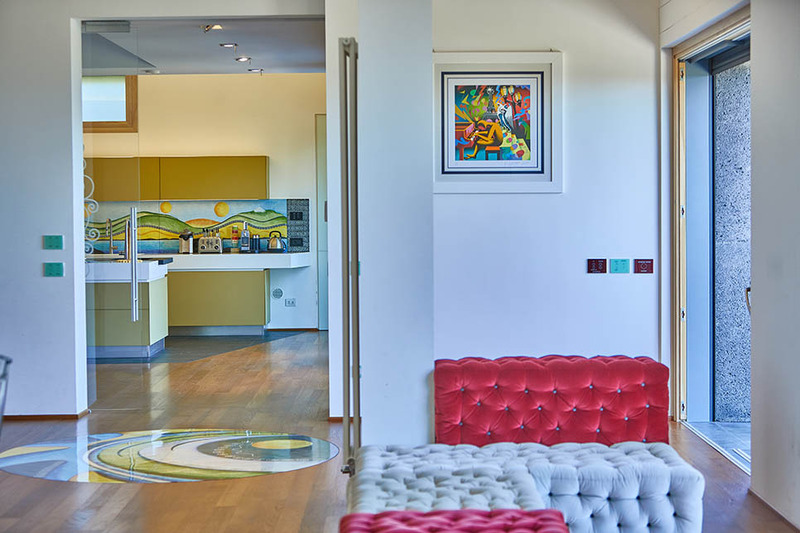 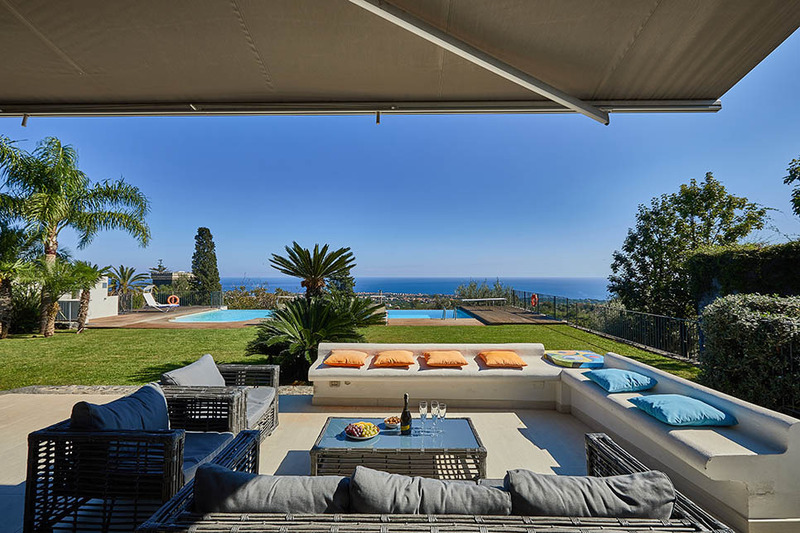 NEW ENTRY: Characterised by elegant contemporary interiors, newly-refurbished Casa dei Sogni is the perfect blend of sophisticated luxury and modern Sicilian style. 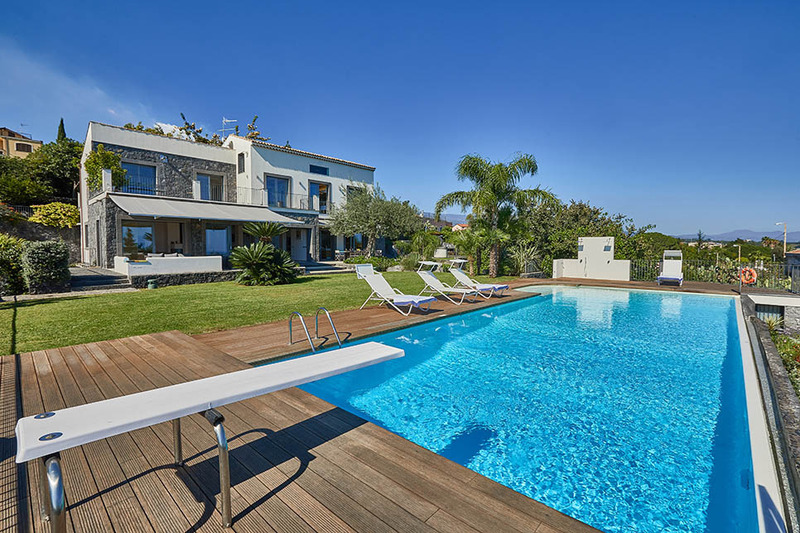 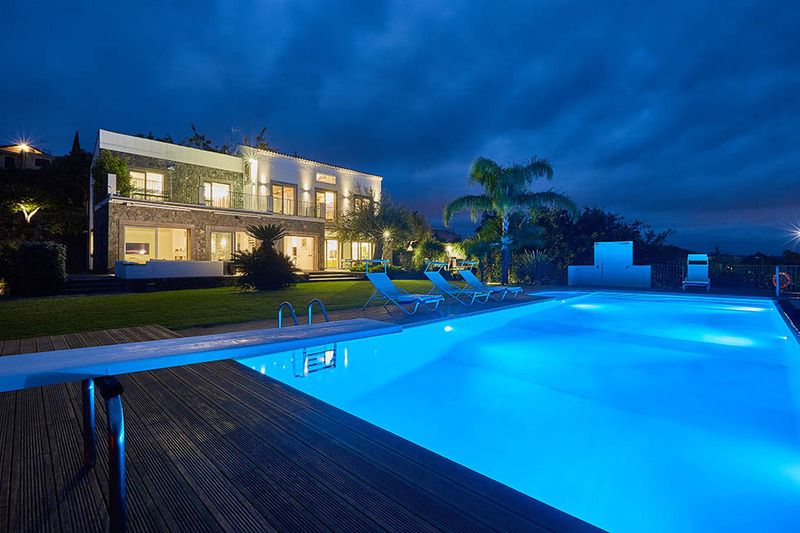 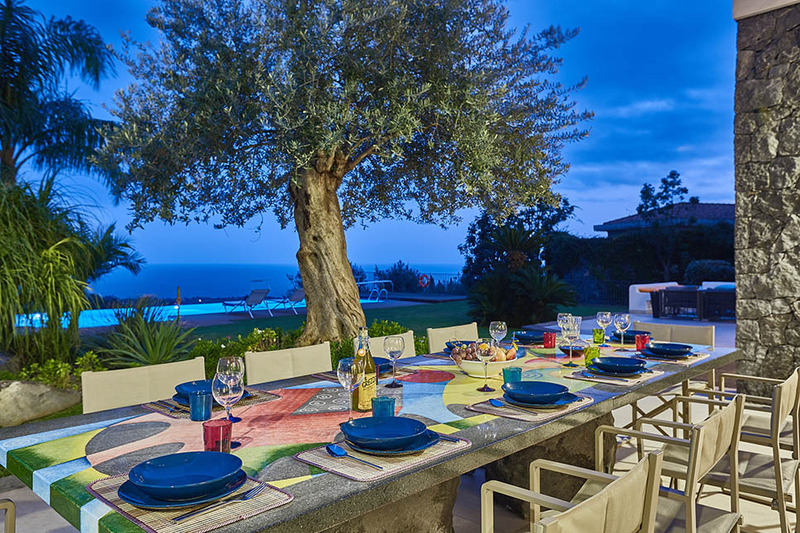 With a stunning pool and children’s play area, the villa provides an idyllic base for a large family group. 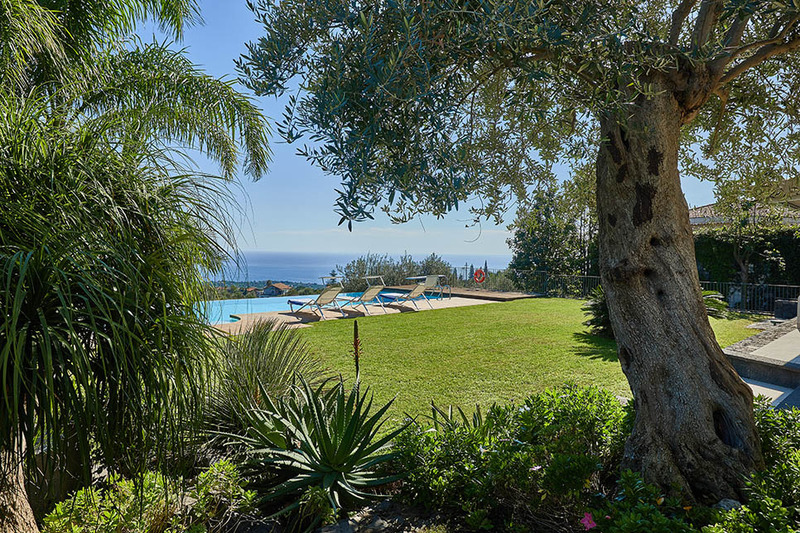 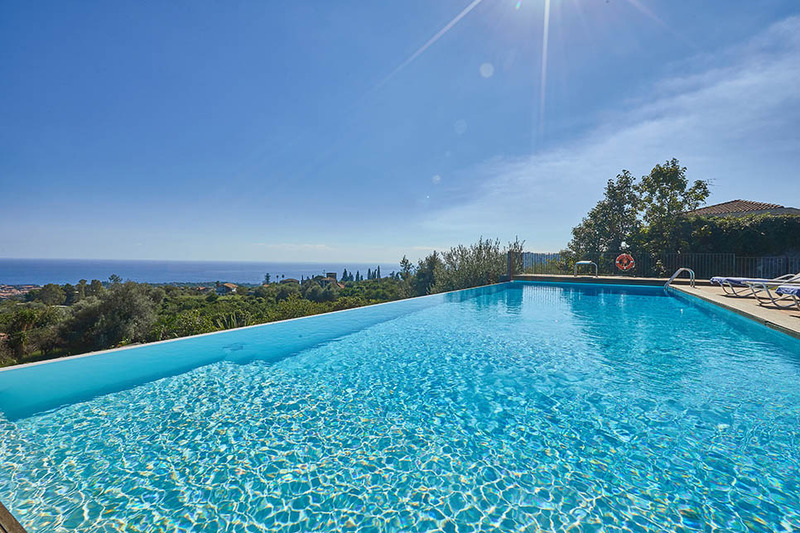 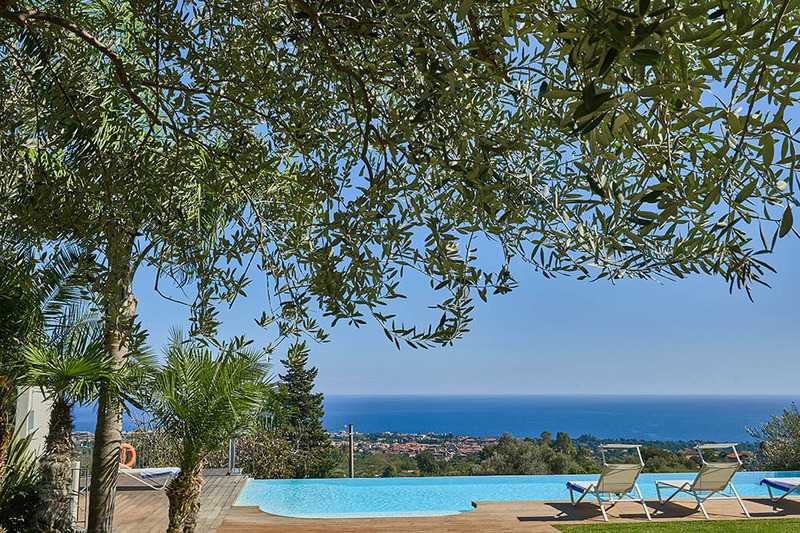 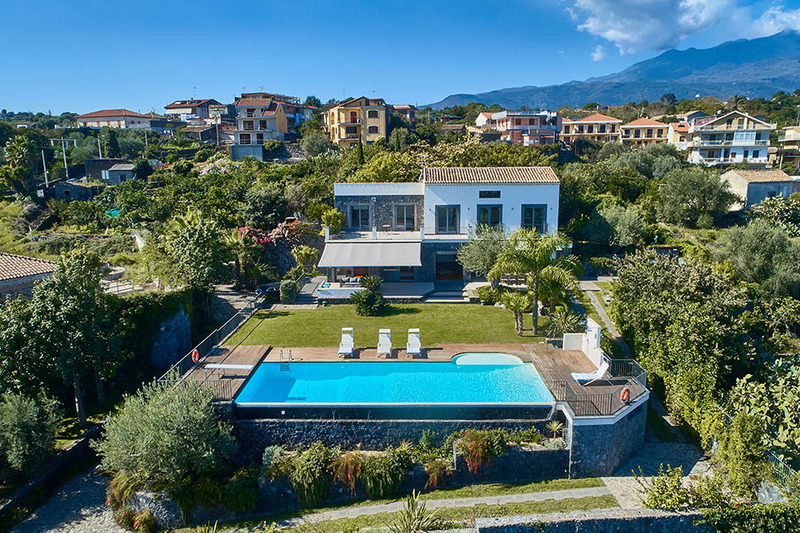 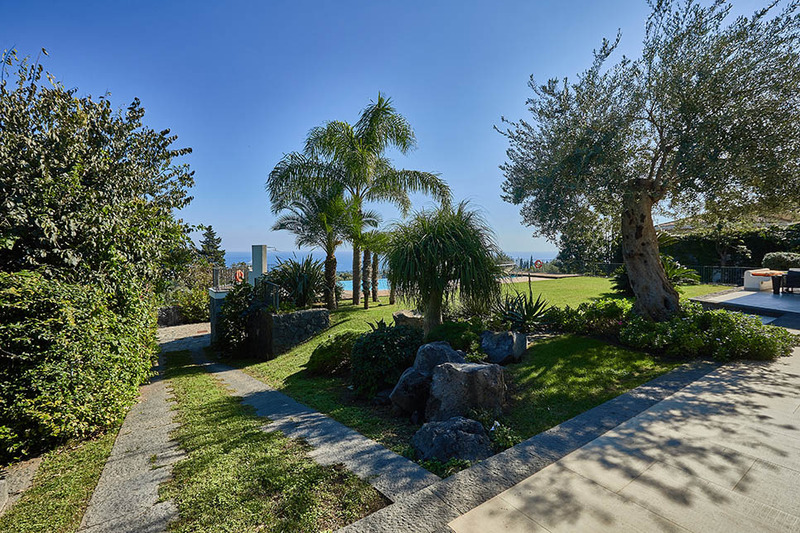 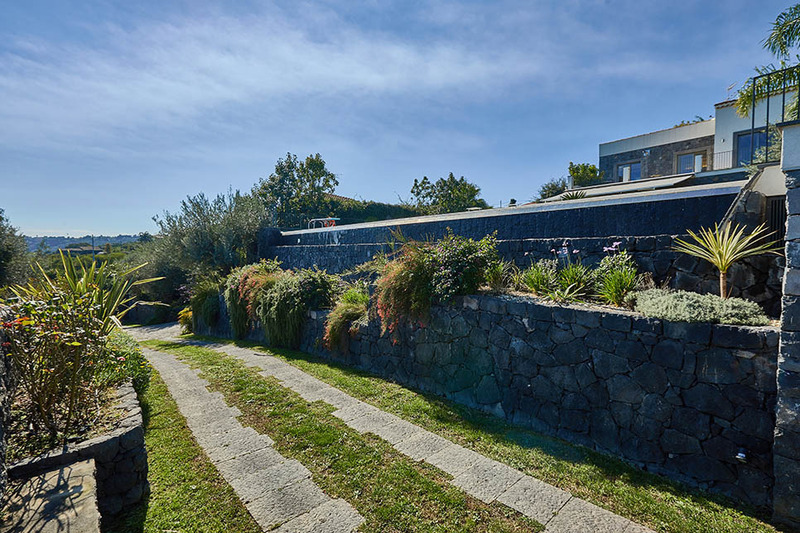 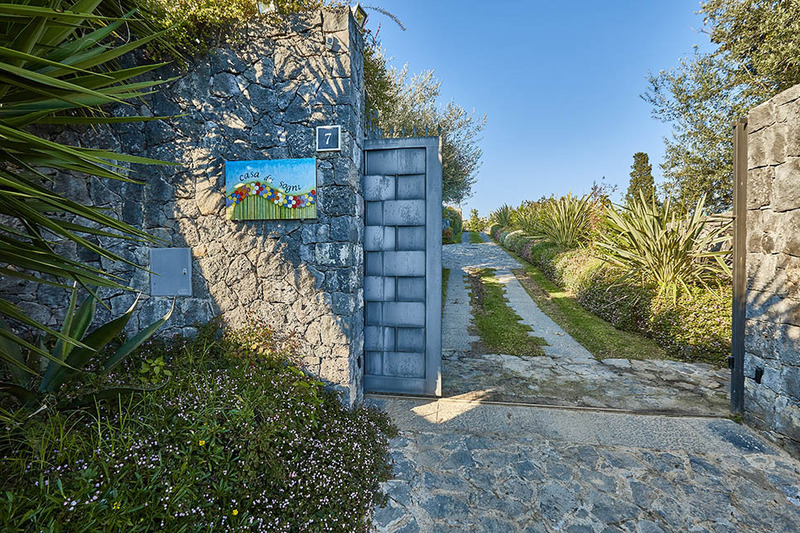 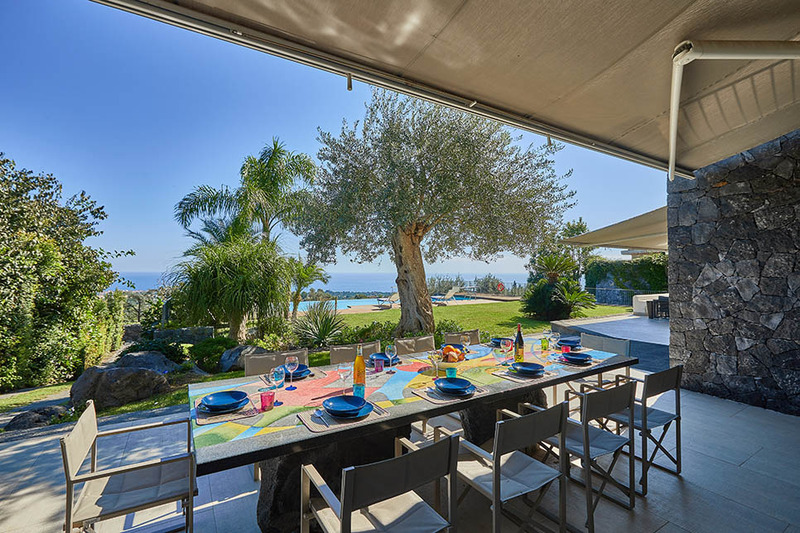 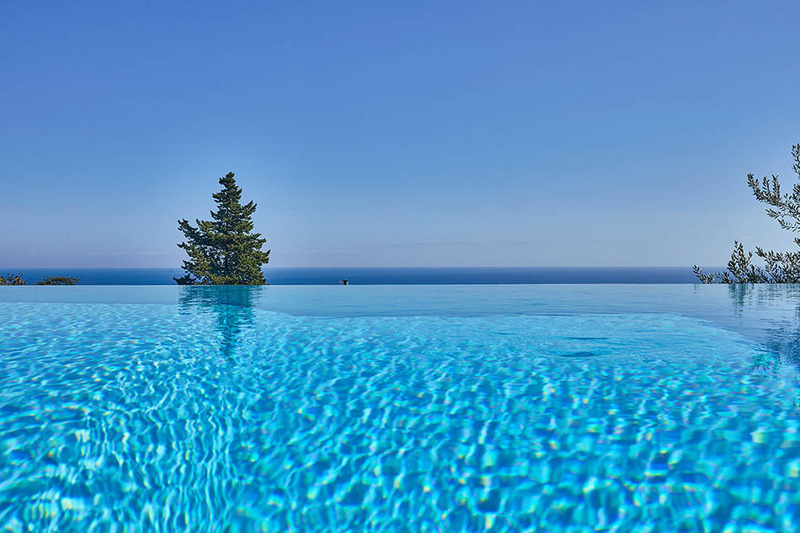 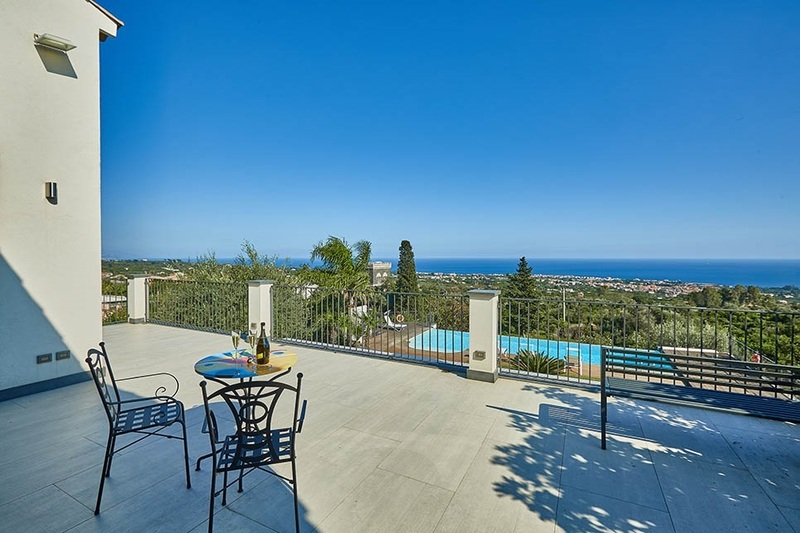 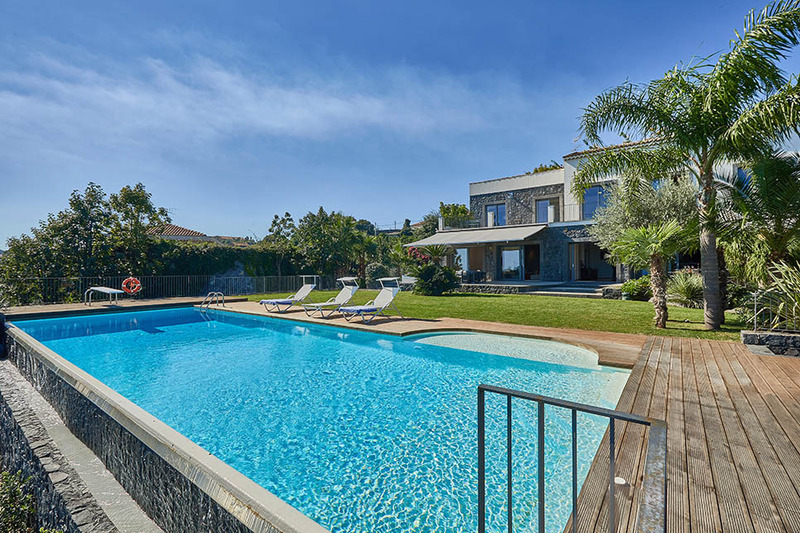 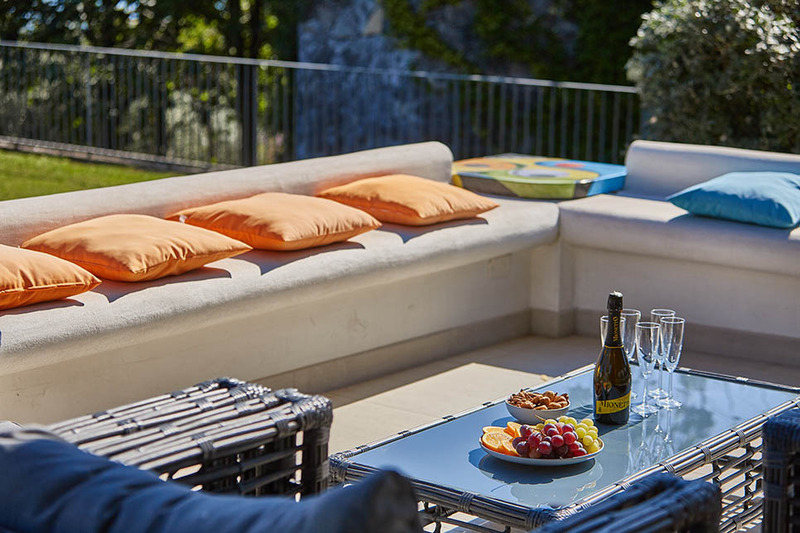 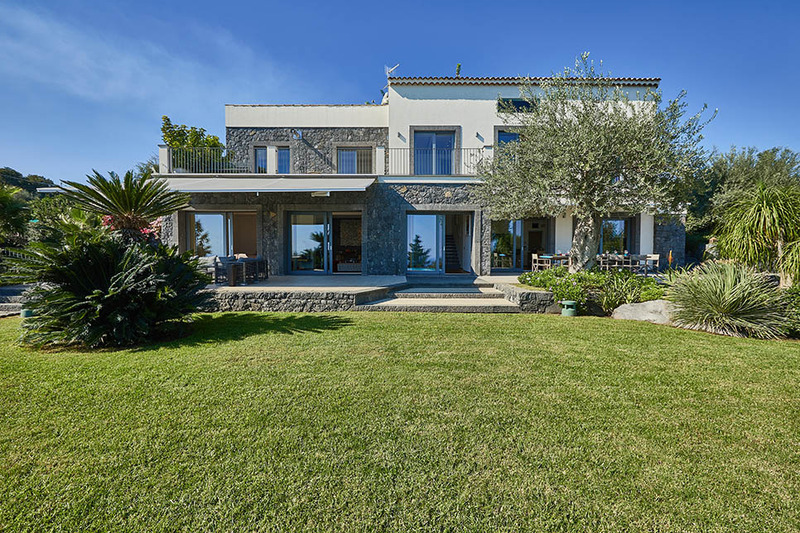 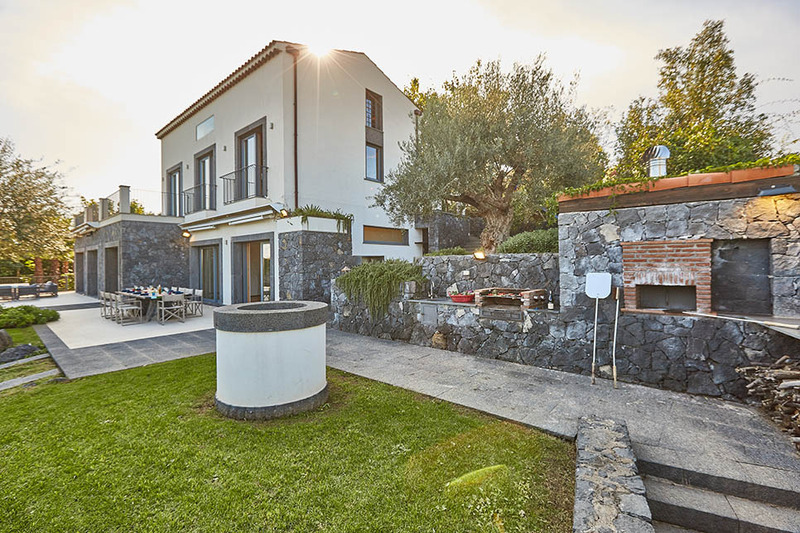 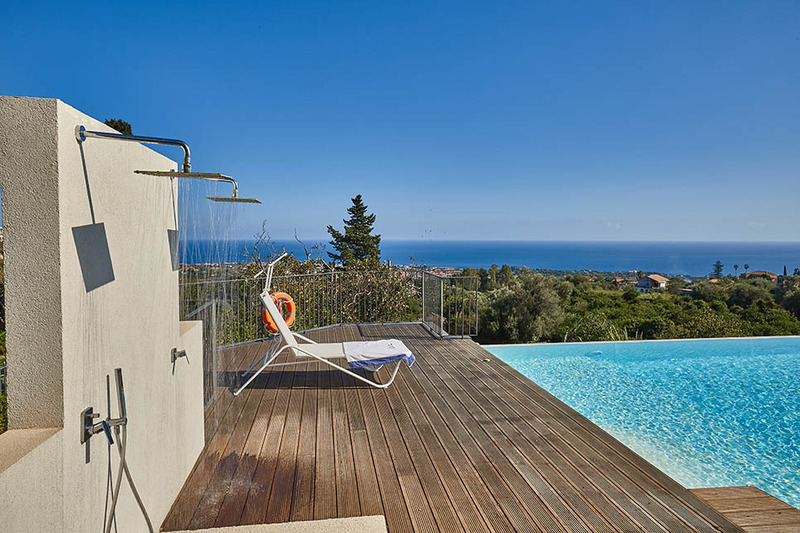 The 5-bedroom gated villa is set near Acireale on Sicily’s east coast, a short drive from the beach and perfectly placed for visits to the wine-producing villages on Mount Etna and charming Taormina. 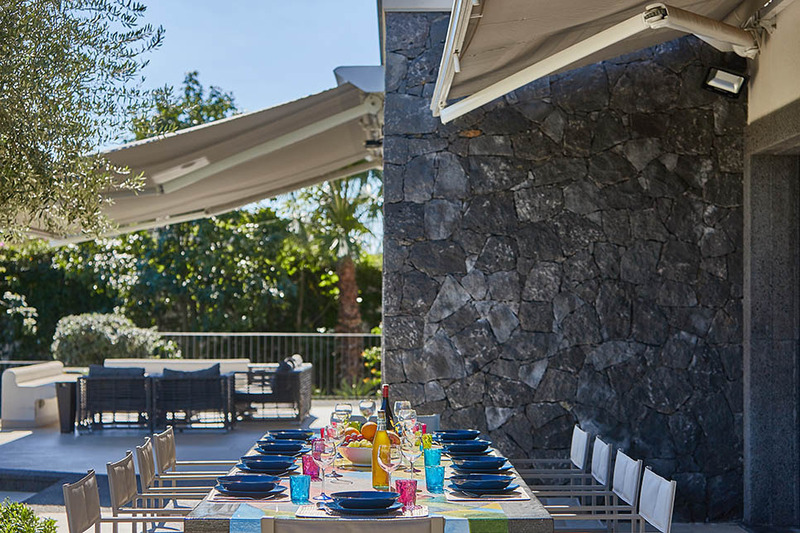 The ground floor of the villa spills out on to a sweeping panoramic terrace, with huge awnings to keep the sun at bay during the summer heat, a stylish dining area and lounge-style seating. 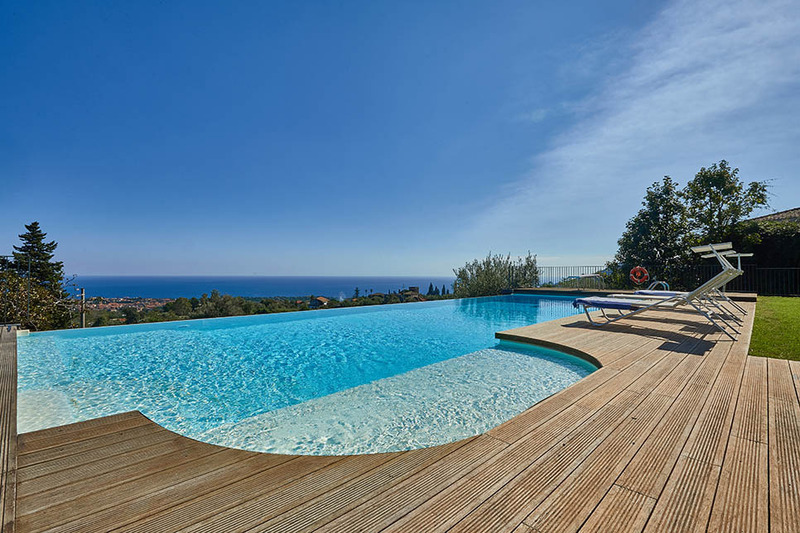 Across the lawn, there is more sunbathing space on the timber deck surrounding the infinity pool. 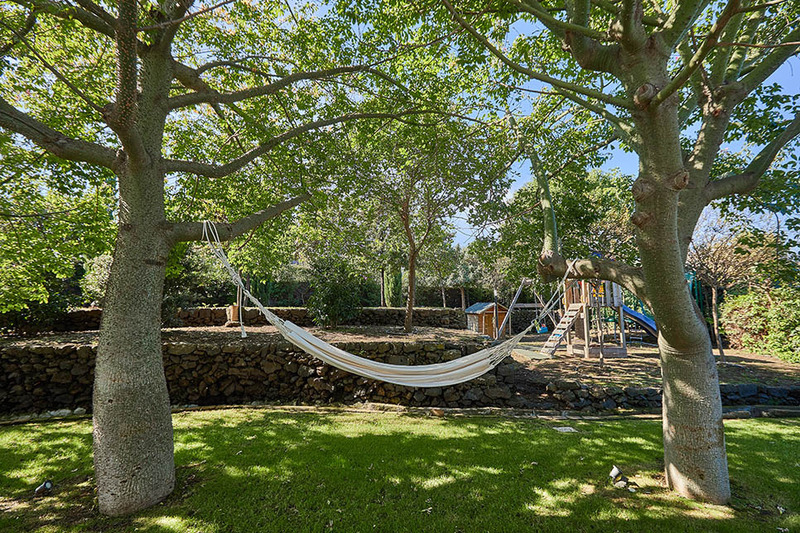 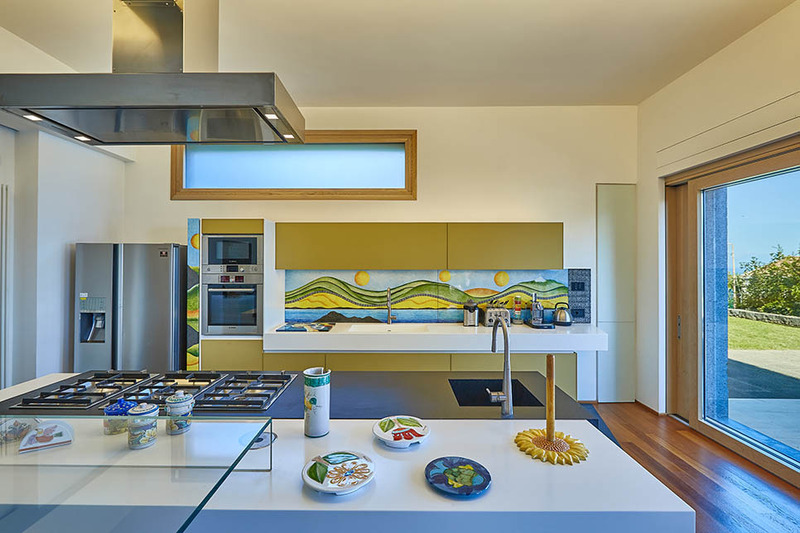 There is a separate outdoor kitchen area with a barbecue and sink and, tucked away in one corner, a hammock and children’s play area (slide, swing, climbing frame and trampoline). 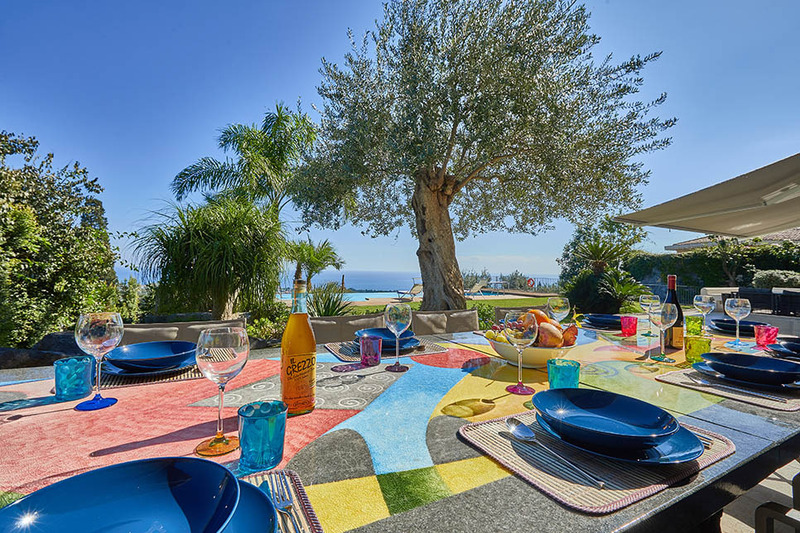 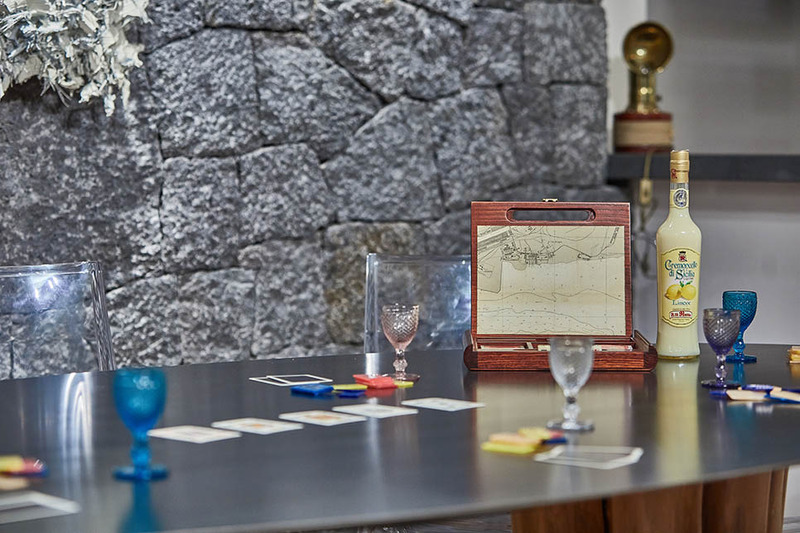 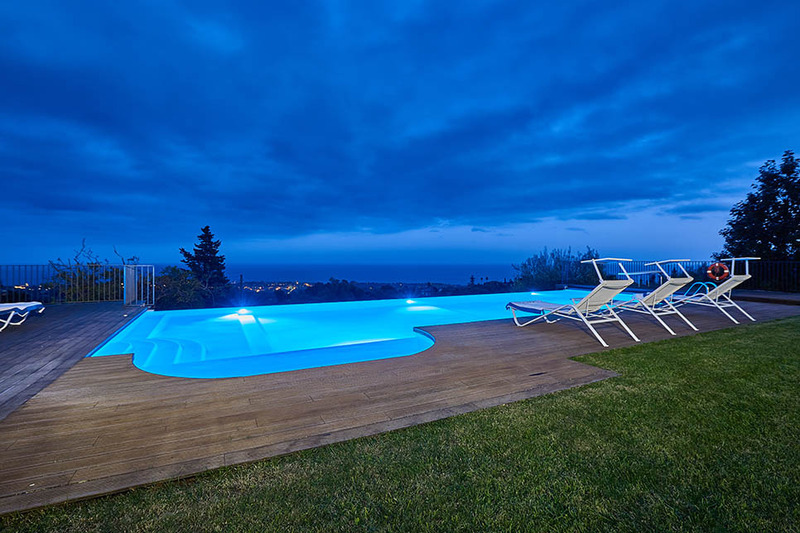 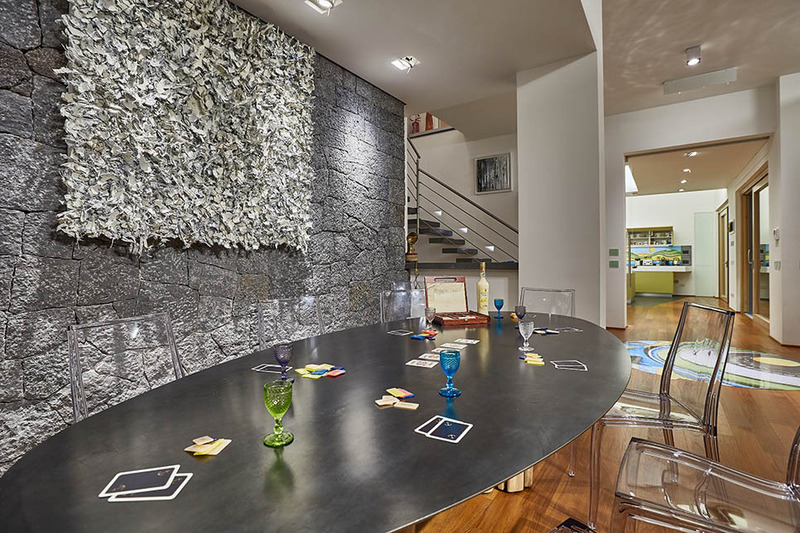 A diving board, toys, games and table tennis equipment (played outside on the dining table) are also provided. 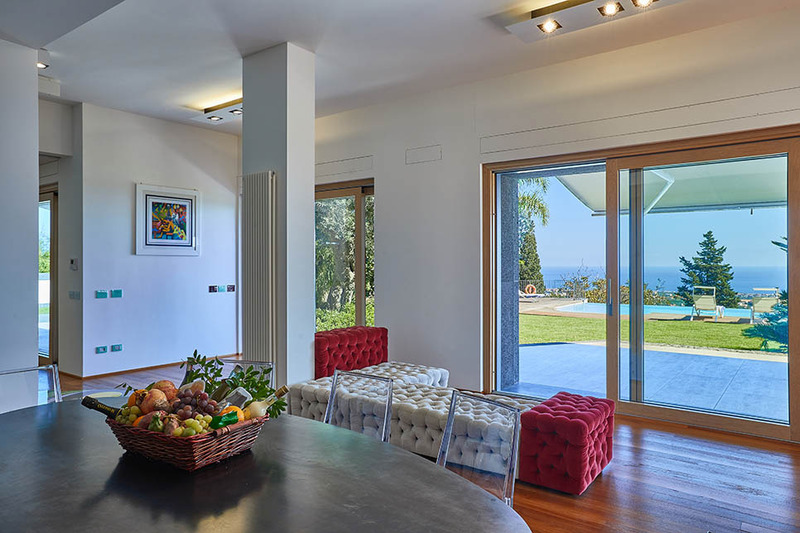 While the immediate impression when you enter the villa is one of open light-filled spaces, you quickly realise that the Sicilian-born owner has invested in every way to create an extremely refined atmosphere, with attention focussed on the tiniest of details. 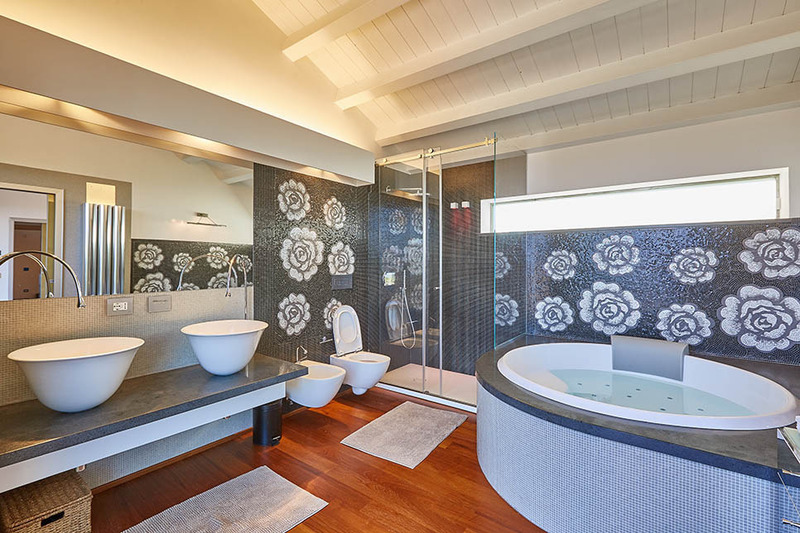 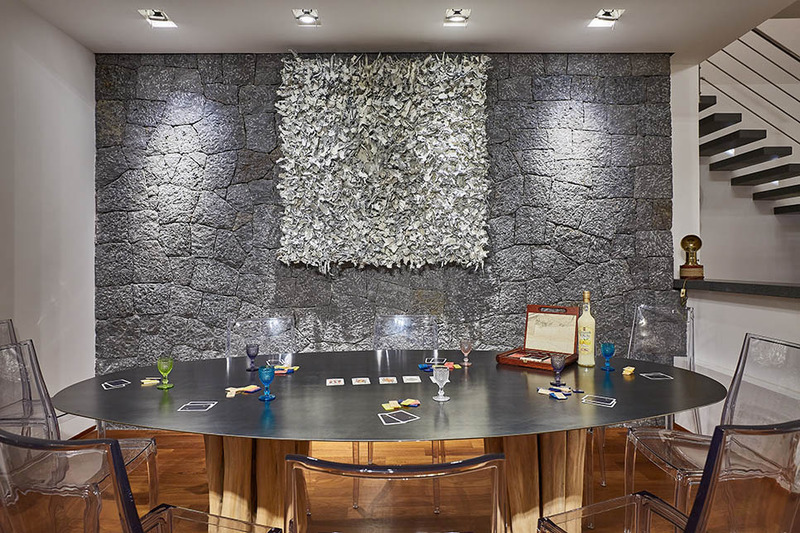 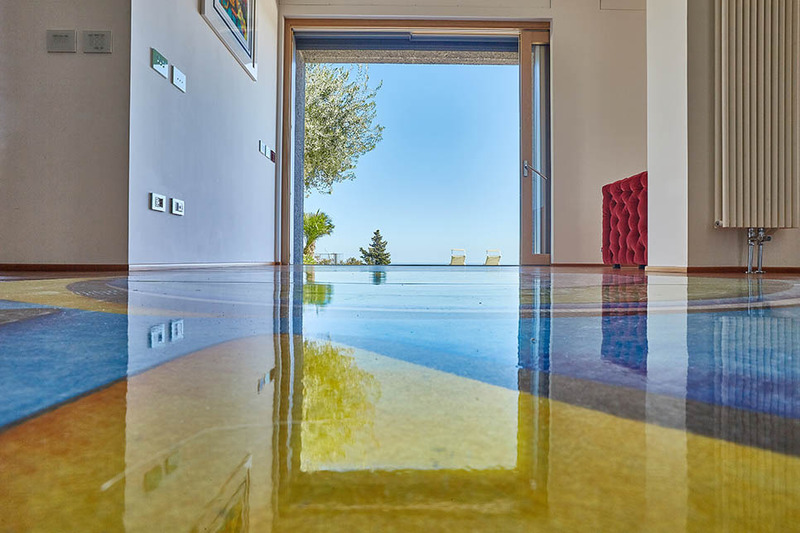 Highlights include the lava stone floor with glazed motif in the entrance hall, the brilliant splashes of colour throughout the villa to reflect the blue of the sea and orange and lemon of the citrus groves and the unique lava stone wall in the dining area. 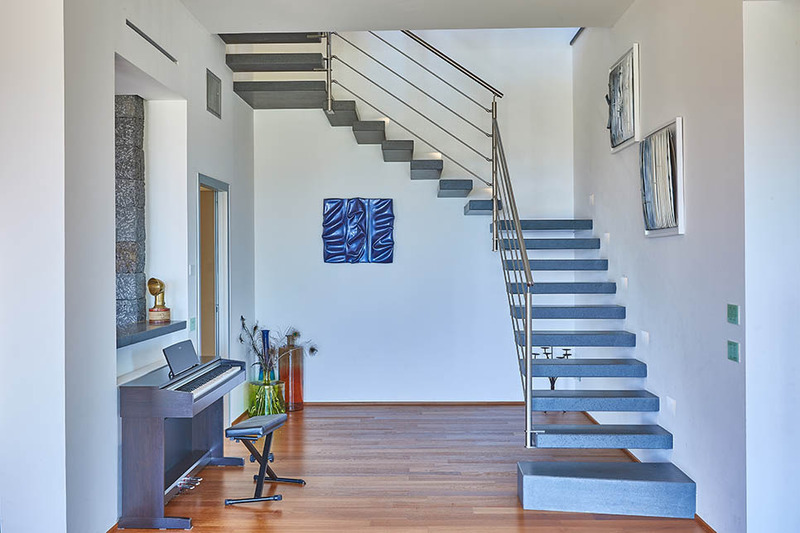 Tech enthusiasts will love the very high-tech smartphone App that controls the alarm system and the outdoor/indoor integrated sound system at the touch of a button. 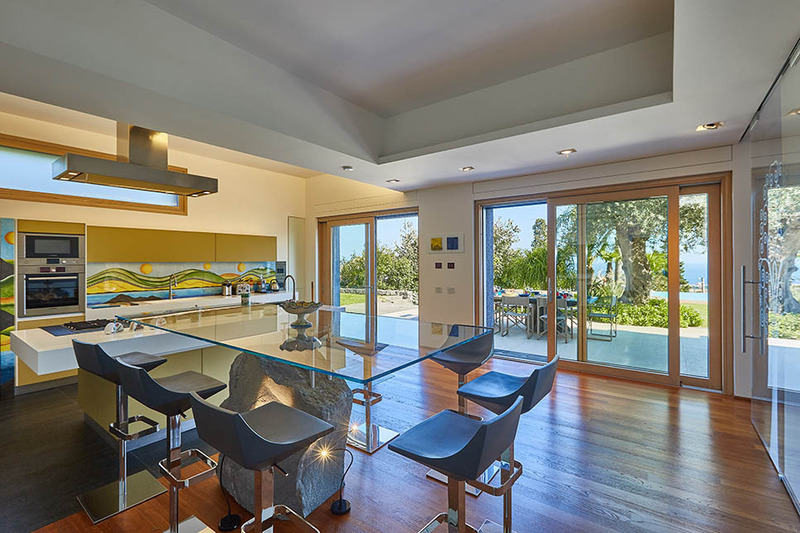 On the ground floor, the open plan living room and magnificent dining area lead directly into a super-accessorised modern kitchen. 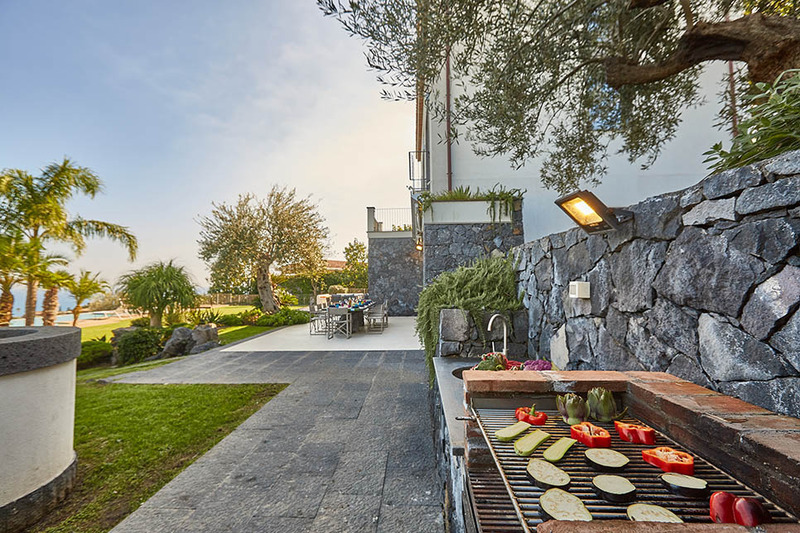 All along the ground floor’s garden aspect, a series of vast sliding glass doors provide direct access on to the terrace. 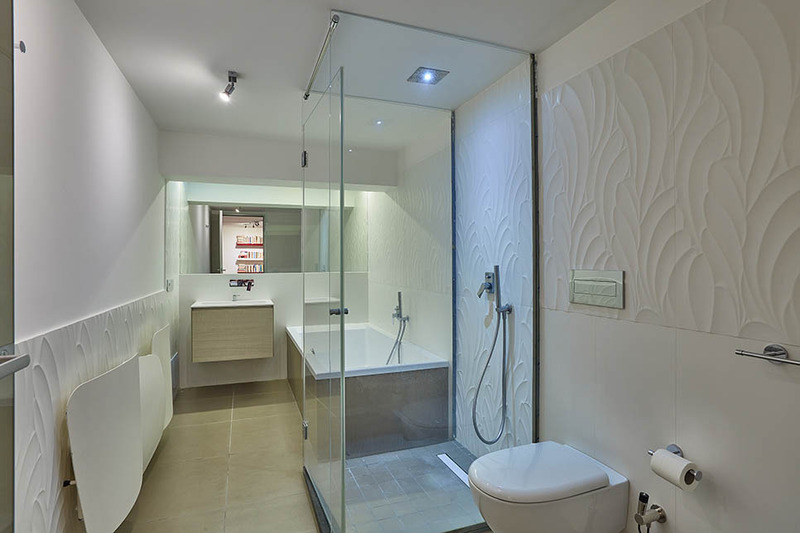 A separate utility room with washing machine is also on this floor. 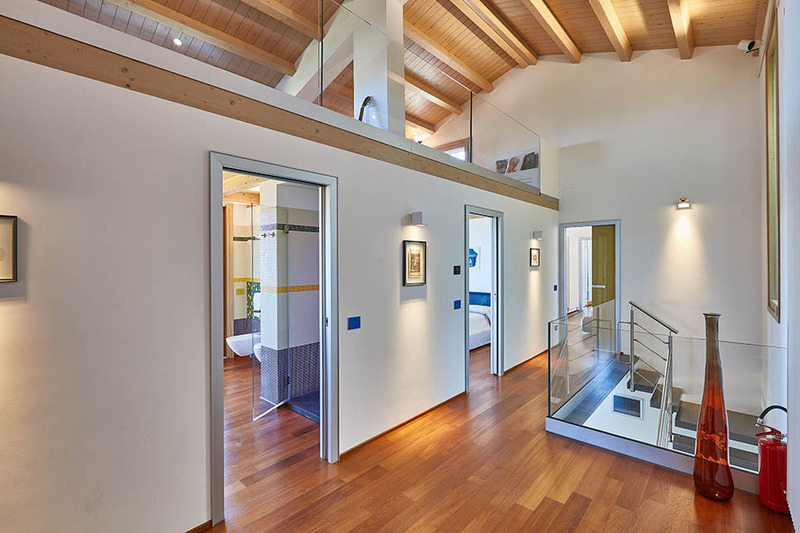 The bedrooms are spread across three floors. 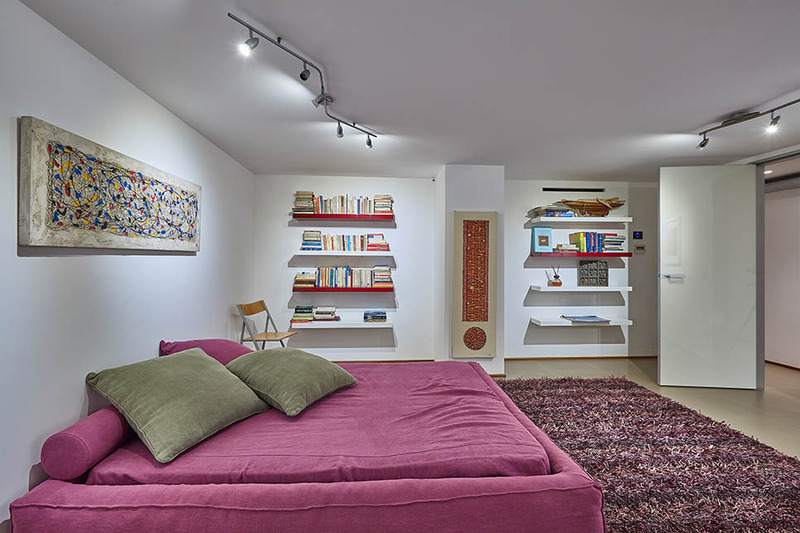 The basement has a double bedroom with an additional double sofa bed, suitable for 2 children, and en suite bathroom (shower). 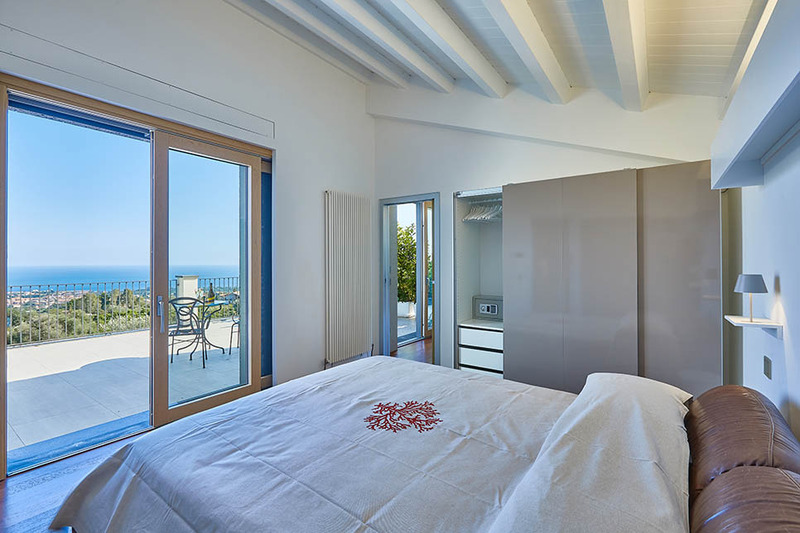 The second double bedroom, on the ground floor, has an en suite bathroom (bath and shower). 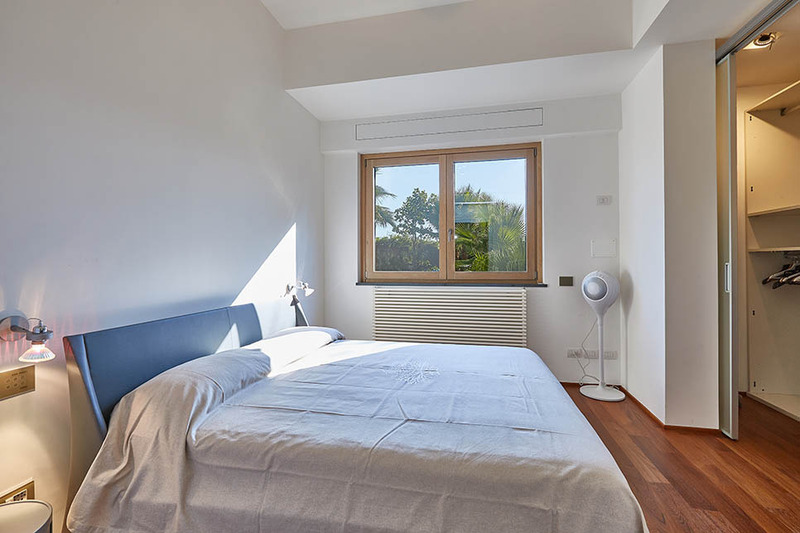 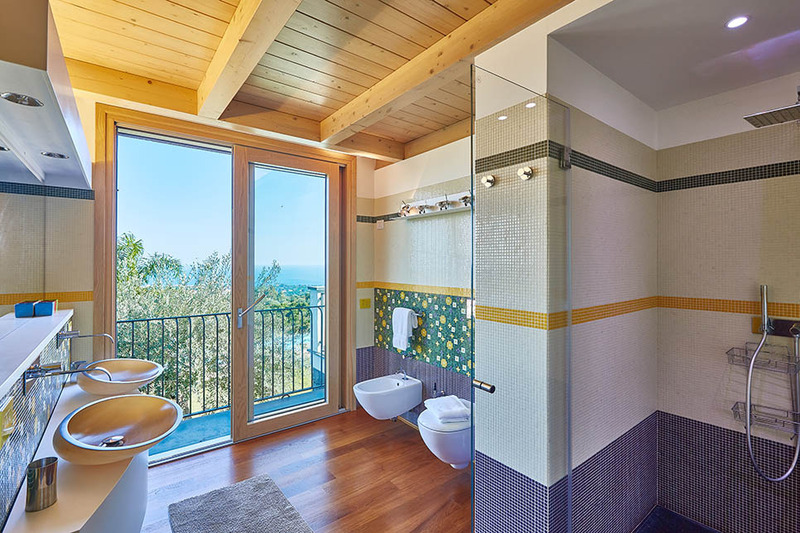 There are three further bedrooms on the first floor: a master double bedroom with an en suite bathroom (jacuzzi bath and shower), and another double bedroom with a separate bathroom that is shared with the children’s triple room (bunk bed and single bed suitable only for children). 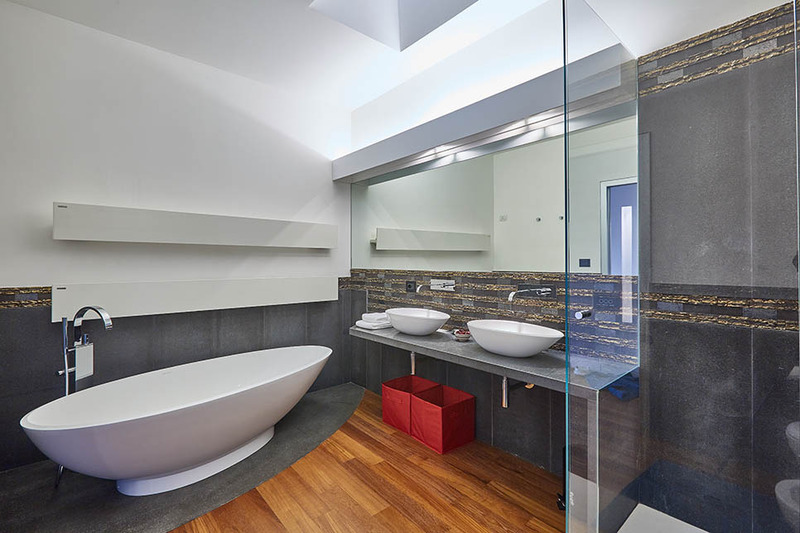 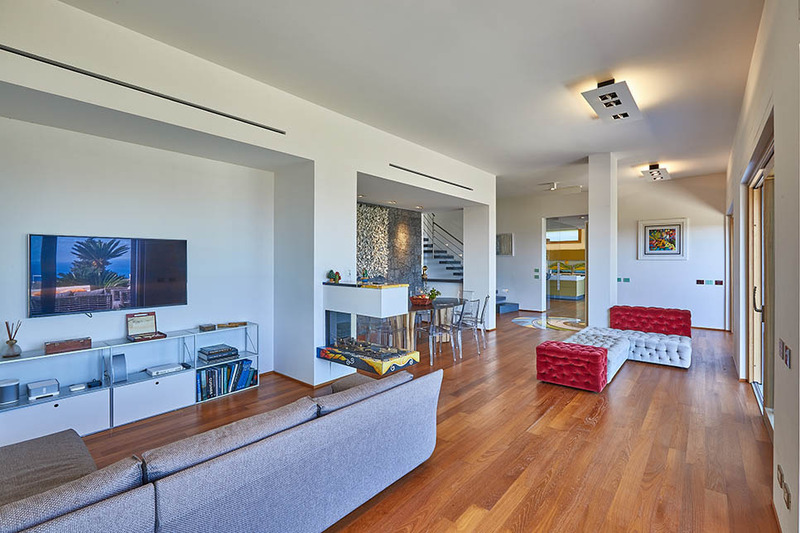 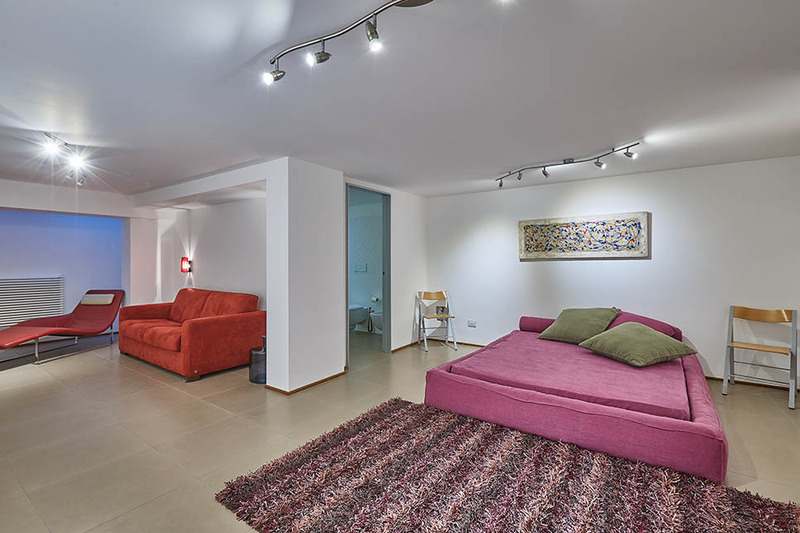 The two double bedrooms on this floor has access to a large terrace. 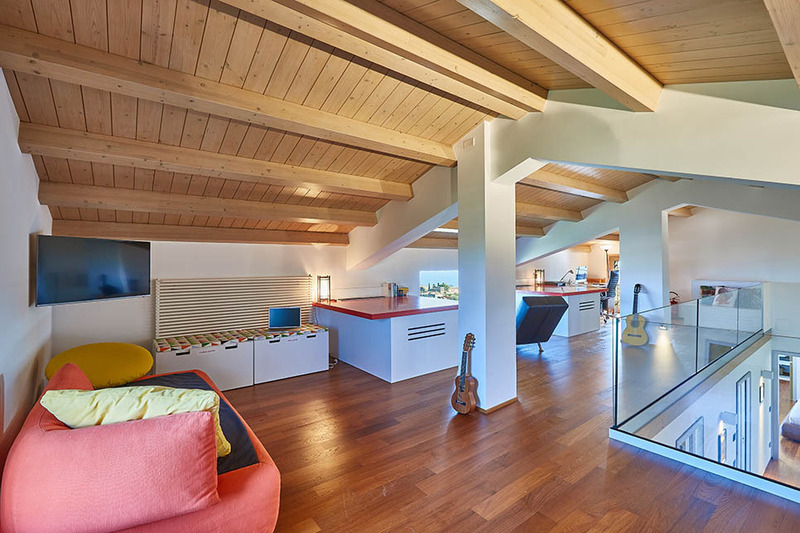 Finally, on the fourth floor, an upper-level vaulted mezzanine area features a games area, TV corner as well as a laptop and Mac. 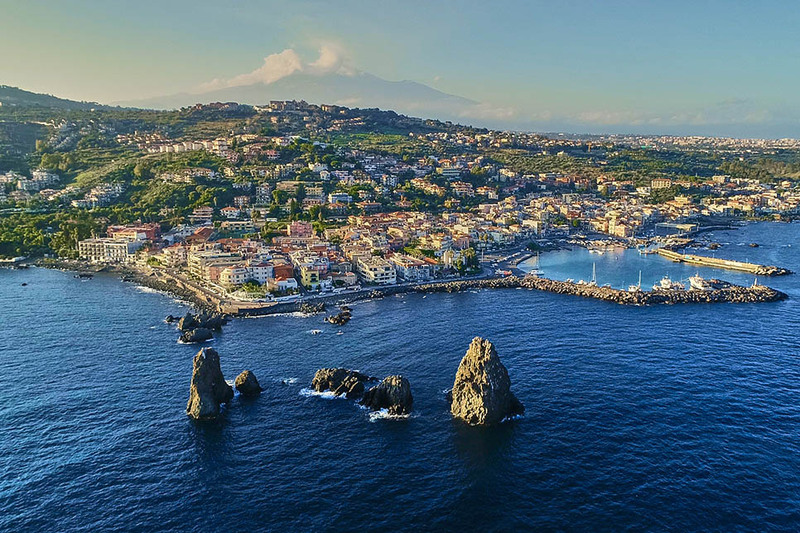 The nearest town to Casa dei Sogni is Acireale (10 minutes by car) but you can walk into Guardia village (5 minutes) for basic provisions. 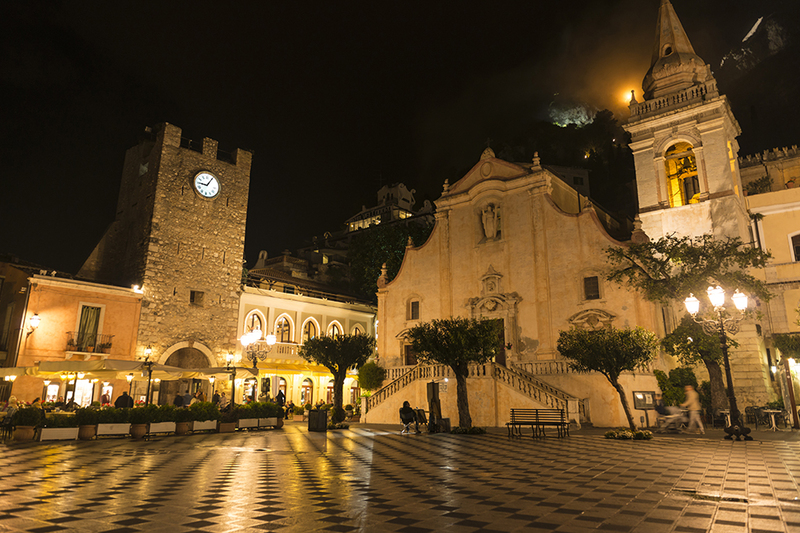 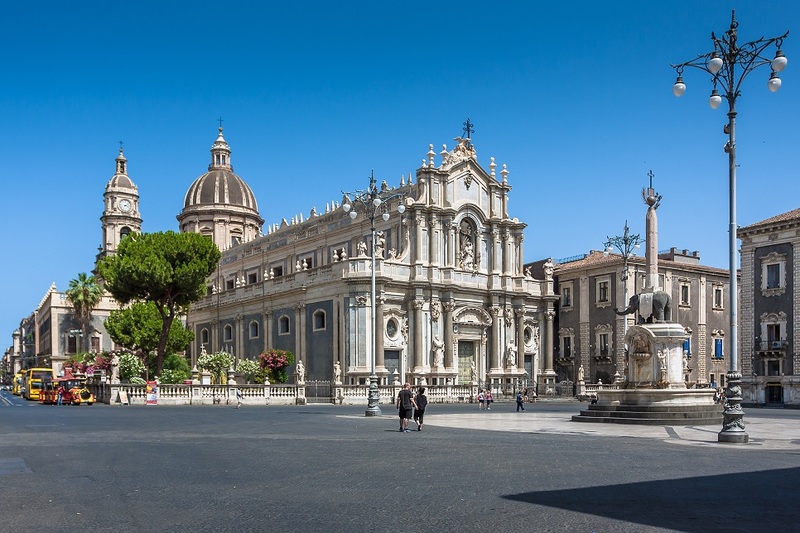 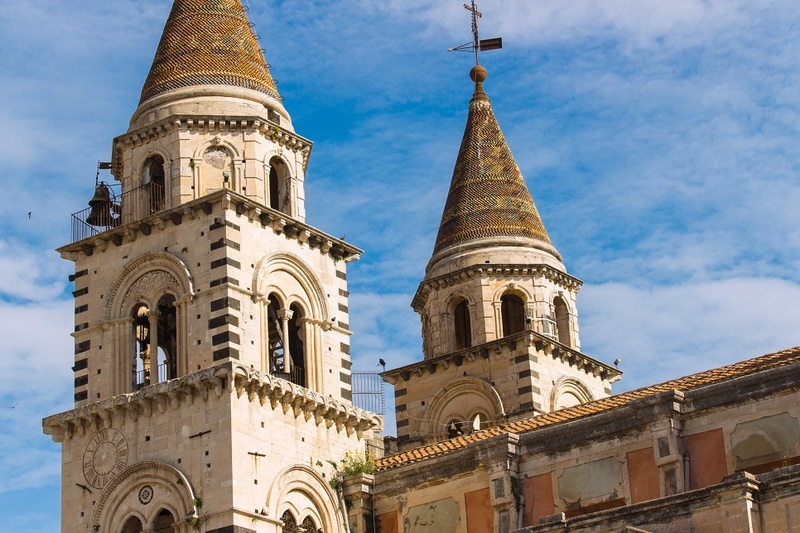 Acireale is best known for its Mardi Gras carnival but also worth visiting for its fine baroque buildings, including the Cathedral and the Basilica dei Santi Pietro e Paolo. 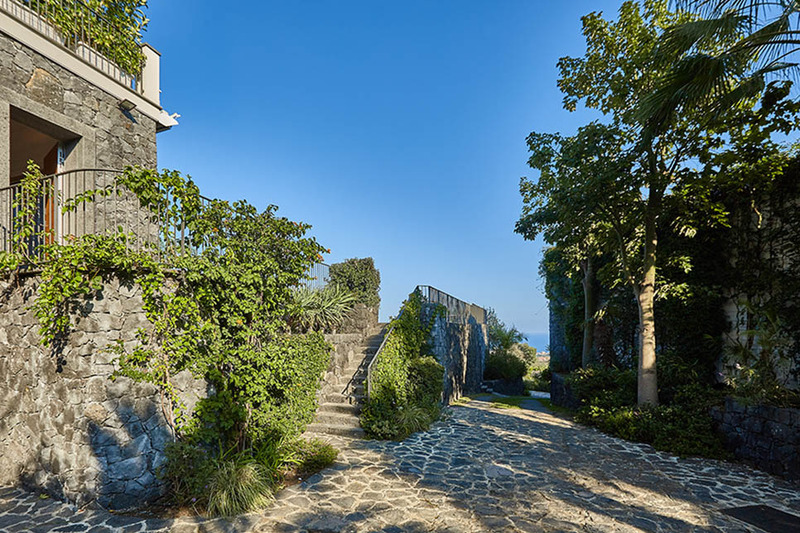 Visit the shops along the Corso Umberto I or stroll through the gardens of the Villa Belvedere for some great views. 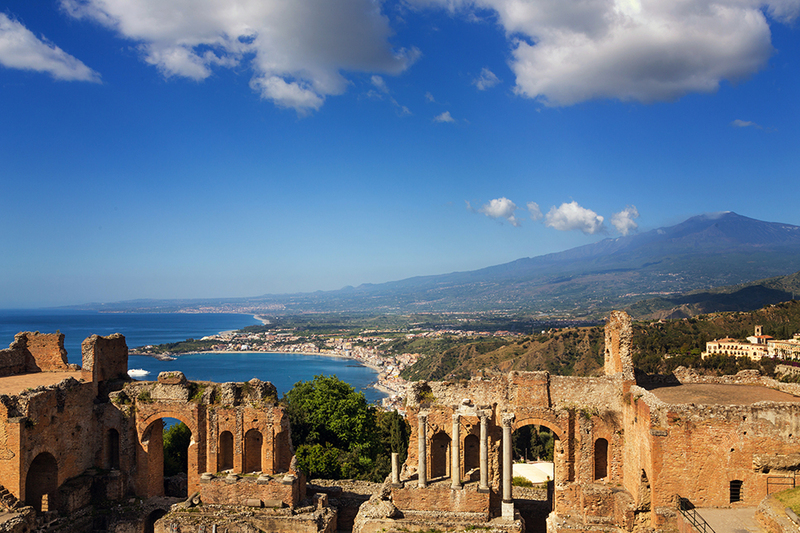 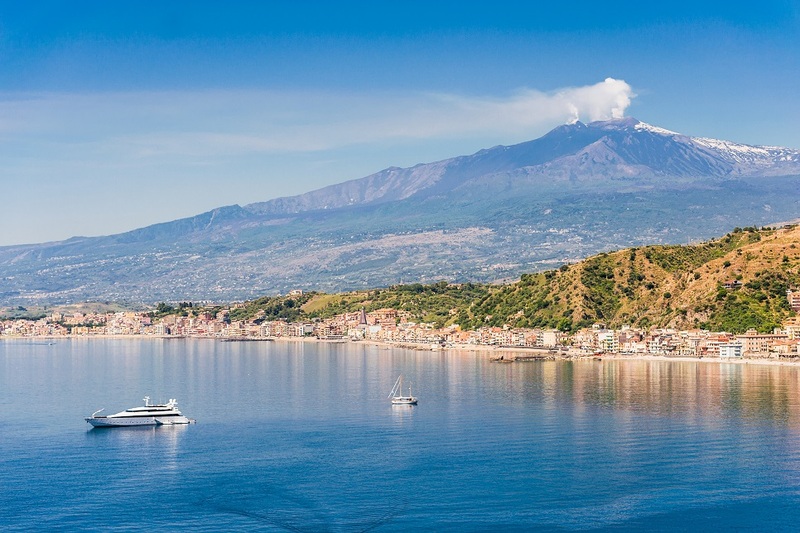 We’d also recommend visiting Catania, and particularly its vibrant fish market, or head north to Taormina where shop windows are glitzy and glamorous, and the coastal views are spectacular. 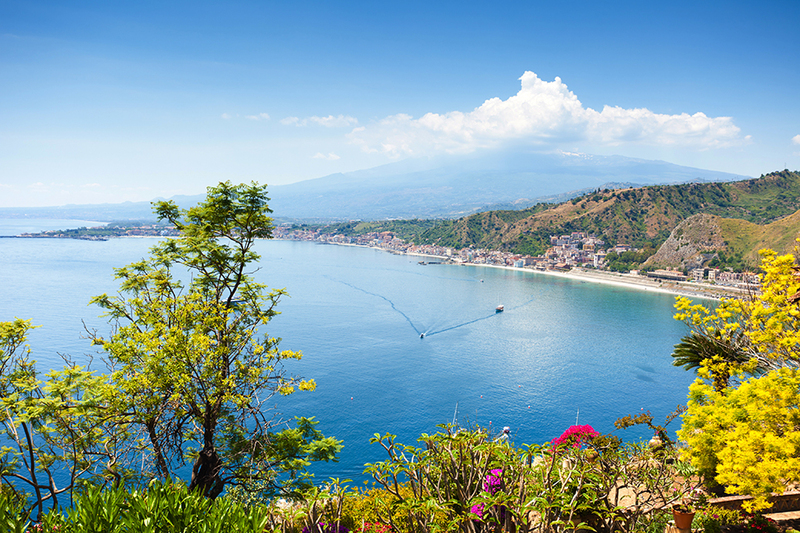 Many of the beaches along the craggy coastline of the Riviera dei Ciclopi are stony which means fewer crowds. 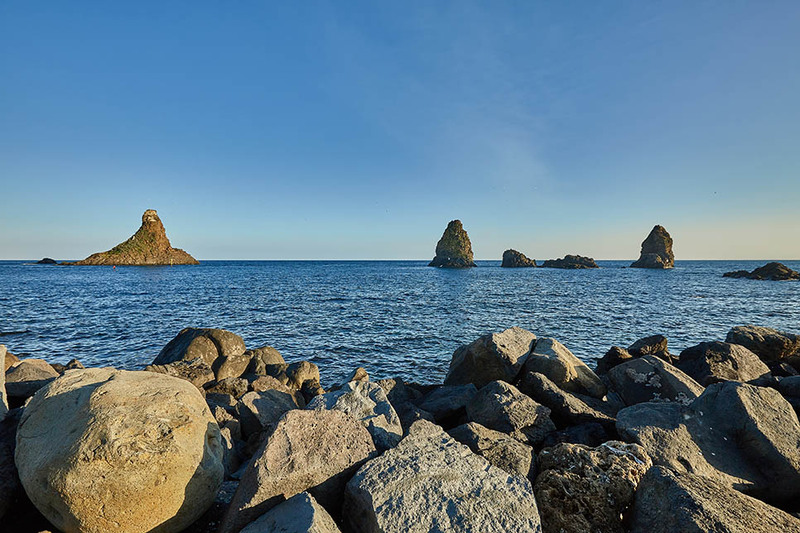 There is an attractive sandy beach at Torre Pozzillo and access to several sandy beaches at the Timpa Nature Reserve. 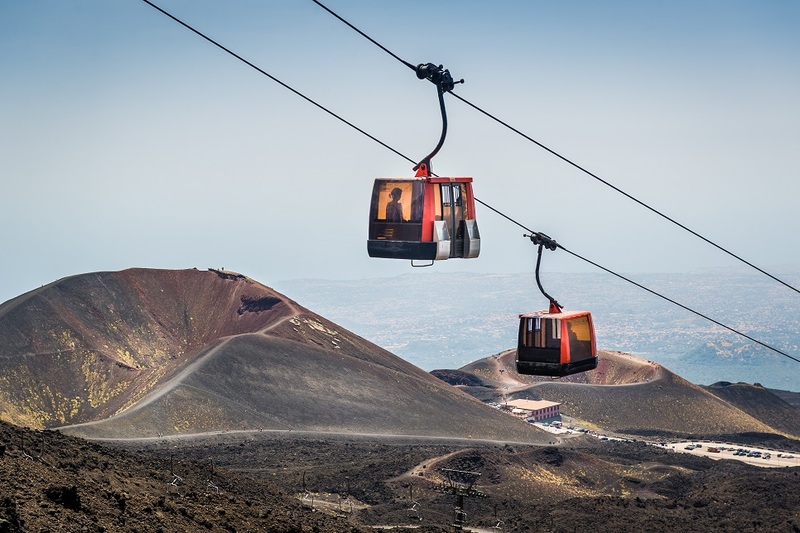 If you prefer to stay closer to home, ask us about the various excursions and activities on Mount Etna, including hiking and cycling tours and wine-tasting at the superb wineries on the volcano’s lower slopes. 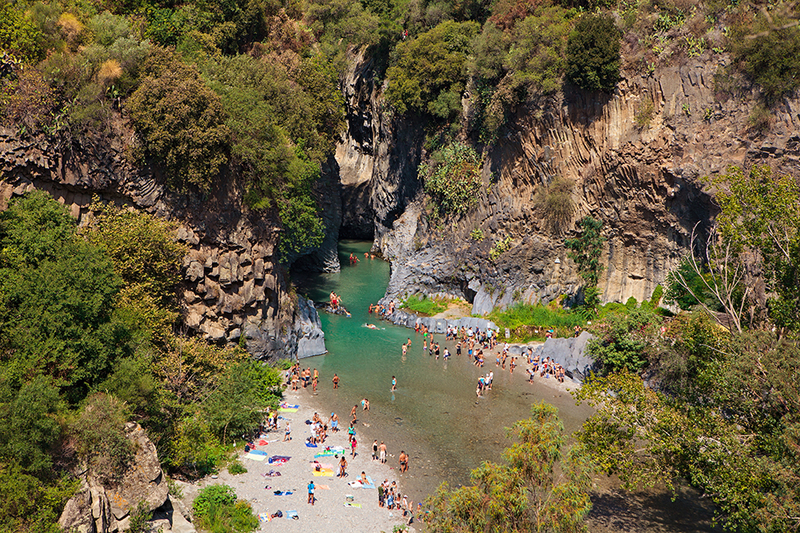 For anyone keen on adventure activities, a range of land and water-based activities are available at the Alcantara Gorge to the north of Acireale. 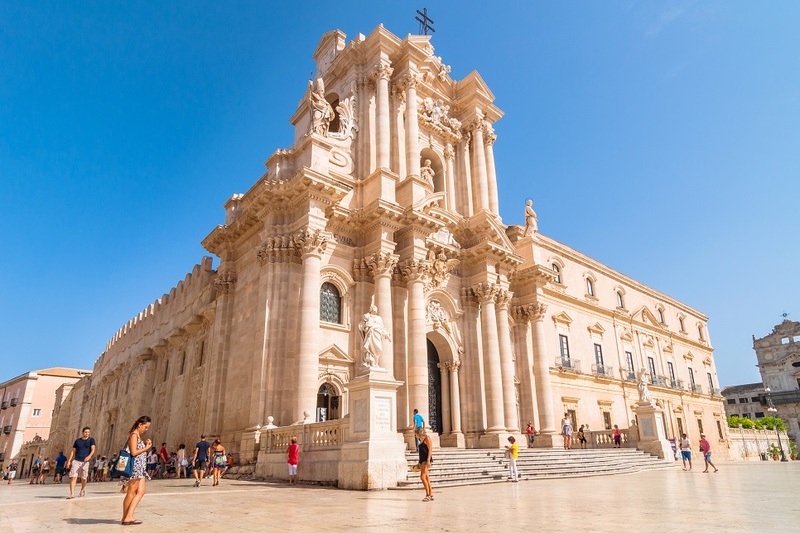 A day trip to the ancient Greek city of Syracuse, which is around 100km to the south, is also well worth the effort. 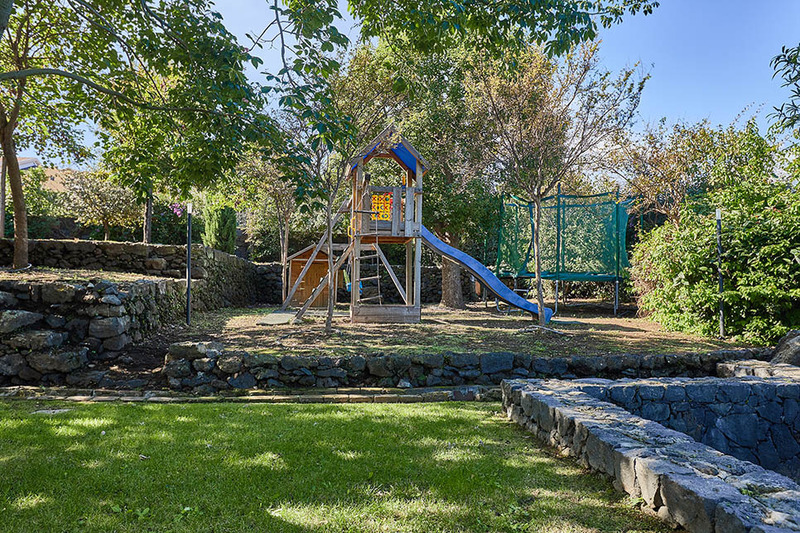 3 extra sleeps (up to 13) only available for children. 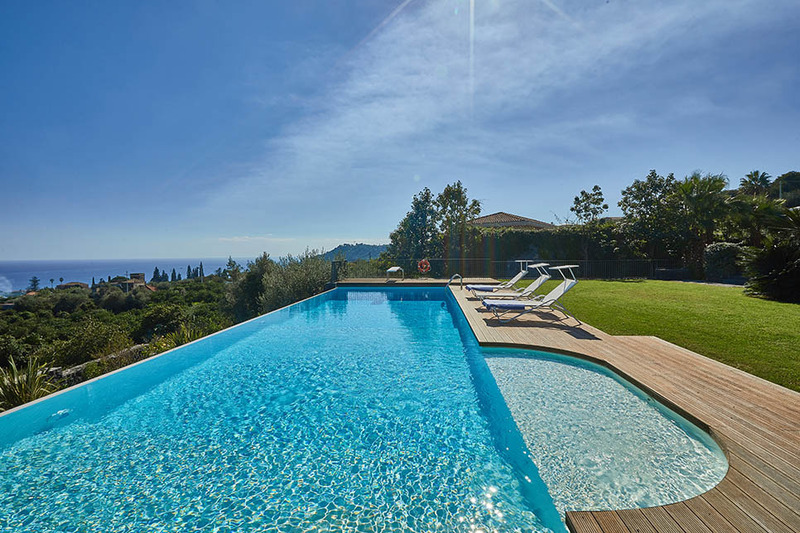 Pool is open to guests from April to October.